This summer we’ve been fortunate enough to travel everywhere from Savannah to Philadelphia. Along the way, one food has popped up over and over again- the crab cake. From crab cakes at my cousin’s wedding to the Low Country Crab Cake I enjoyed Monday (more on that later), it’s been the summer of crab. And we are not complaining. Living in Maryland has taught me many things, a lot of which pertain to crab. I’ve learned how to cook crabs, pick them, season them, and transform lump crab into delicious cakes. 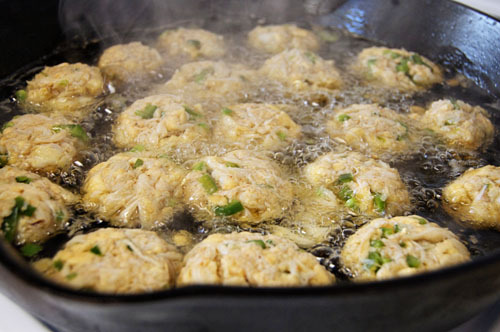 The trick to a perfect crab cake? More crab, less filler. My friend Jamie taught me that one. 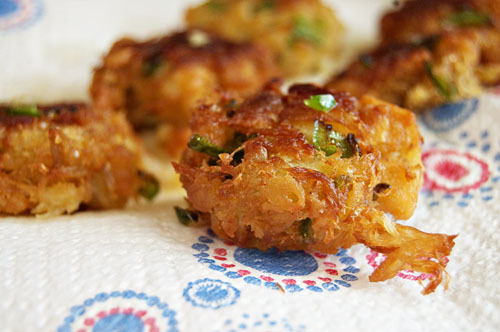 When we were heading down to the Swamp House last month my dad and I were tossing around recipe ideas and he mentioned that he had some lump crab he needed to use, and thought maybe jalapeño crab fritters would be the perfect appetizer one night. So when Dan and I were planning our night to cook, we decided to start with these. In true Rosemond fashion, my dad backseat drove the kitchen situation as I was making these. “You’re not adding too little filler, are you?” was his prodding question of choice. I told him to trust me, that I’d learned a thing or two during my time in Maryland. I’m happy to report that they turned out perfectly. So perfectly, in fact, that the Captain admitted that they were the perfect ratio of crab to delicious. 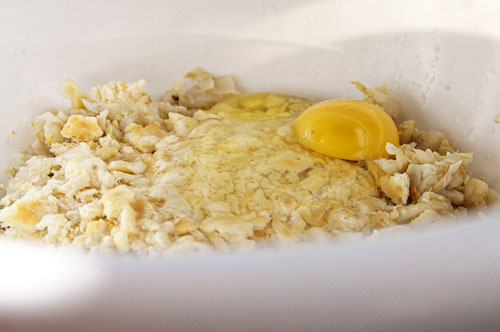 Mix together all your ingredients and form small cakes. Heat 1/2″ oil in a deep pan and fry the cakes for 3-4 minutes each side, or until golden brown. These were awesome! Just the right amount of spice and a great mouthfeel! These look incredible! Thank you so much for sharing them! It has been a LONG time since I went to Maryland, but I remember the crab cakes vividly and am always wanting to have some at home. Living in Louisiana, you’d think that a lot of restaurants would offer this – and some do – but there is something so satisfying about making something like this yourself. 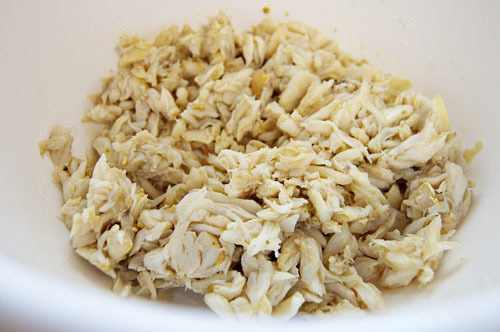 And I am definitely going to be whipping this up sometime in the near future if I can get my hands on some fresh lump crab meat! Thanks, Erin! 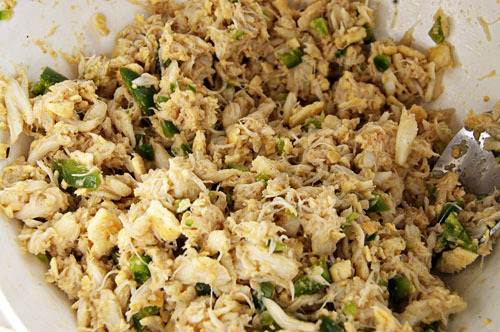 Good luck finding crab meat! 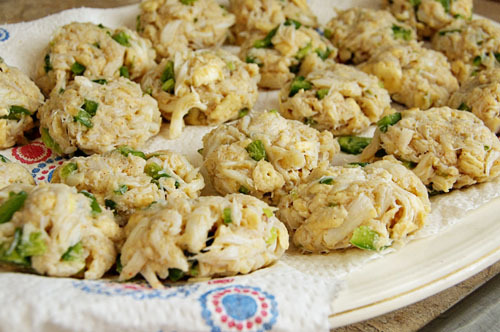 These look really good and I have had trouble finding a crab cake recipe that I like. Can you suggest a dipping sauce to serve with these or would cocktail sauce be okay? I would suggest tartar sauce! It’s my favorite for dipping crab cakes. Why can’t I print any of these recipes? Hi Bridget! Sorry for the inconvenience! It seems our printer plugin broke, but should be up and running now.